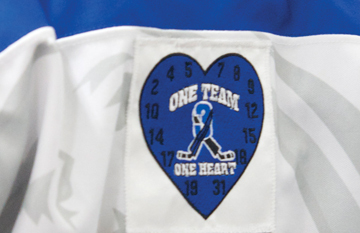 The Redcliff Grizzlies Blue atom hockey team’s Saturday game against the Magrath Chiefs in Irvine was the first game since the sudden passing of their captain Dexter Druar on Jan. 18. While understandably so there were emotions at the arena, it was being around one another that made the bond stronger for these 10-year-old players. “The boys want to play for Dexter and that’s the message we’re getting across,” said head coach Dana Rieder. Between parent support and the local hockey circles, they have been in this together, he added. “As a group we came here with a game plan of be prepared. Have the parents in the dressing room before the game to have some private words,” he said. Co-coach Ryan Dreger said the rest of the year will be about mentoring the kids to be good people as well as being good players. “This has been tough on every one,” said Dreger. The Chiefs were aware of the circumstances, but for head coach Dustin Godlonton it was about the connection through the sport. “It’s an amazing thing how teams that might play each other a couple times a year and it might be years before they play each other that we can come together and have respect for each other and enjoy the game,” said Godlonton. “It’s definitely fitting,” said Rieder. Redcliff may have lost the game 6-2, but in other ways it was a victory in their hearts for the team to hit the ice and play the game just like Druar would want them to.